As part of our trip to Morocco we spent one night at a Bedouin tented camp in the Sahara Desert. 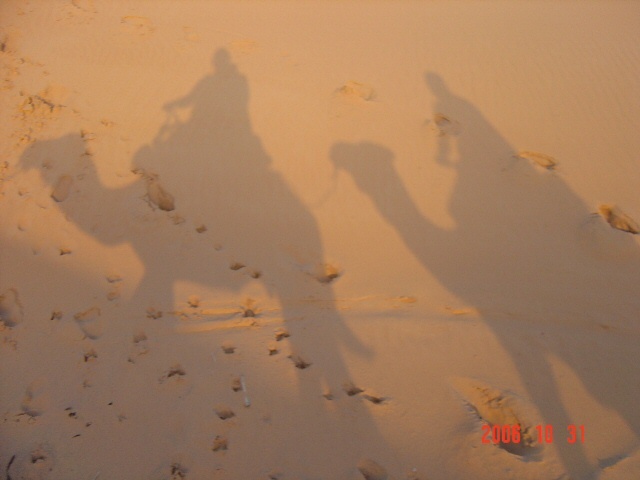 We arrived in the afternoon and after settling in we decided to take a camel ride at sunset. 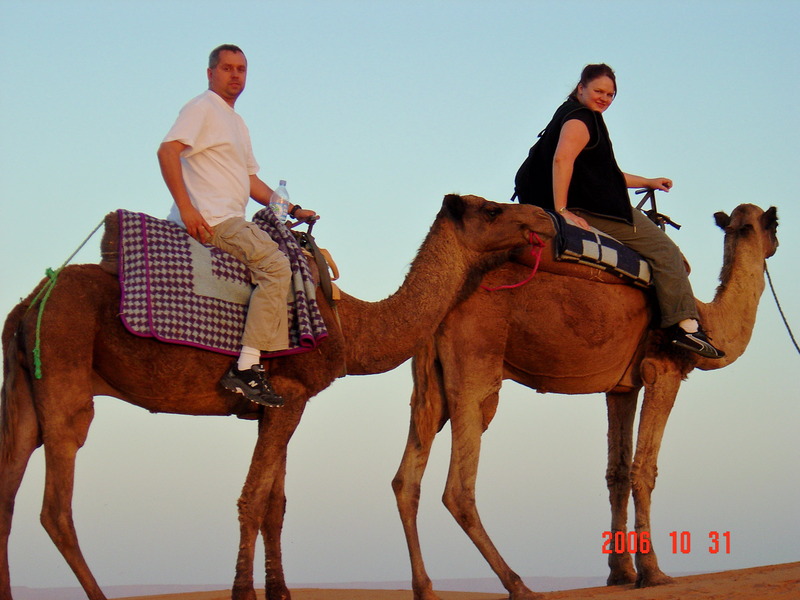 This was our first time on camels and we didn’t quite know what to expect. You hear stories of spitting, angry camels so we mounted them with some trepidation. Though I am sure these Bedouin men had never seen the Dog Whisperer, they were unknowingly employing his techniques with their camels. 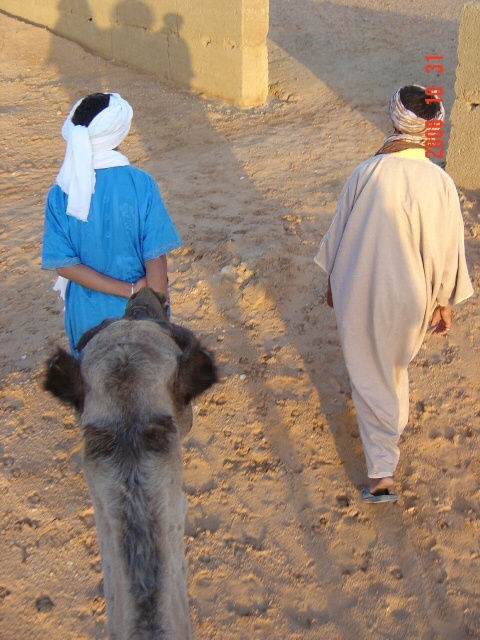 The calm energy and relaxed vibe of the men leading, was transferred to the camels following behind. 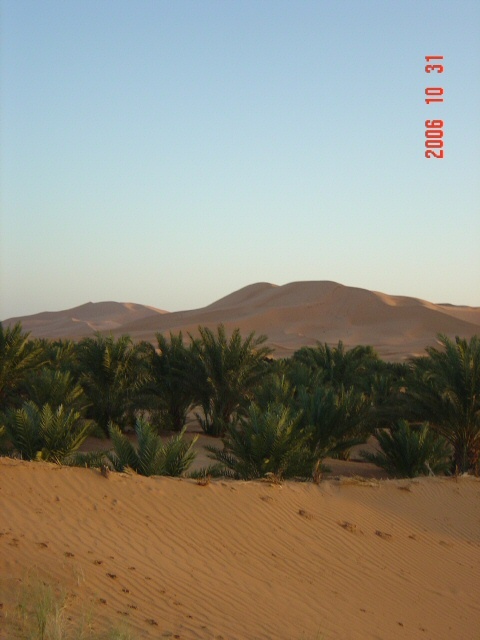 We set off into the Sahara on the most peaceful journey. Doesn’t he just look content? Soft, earthen red sand under hoof made the ride smooth. 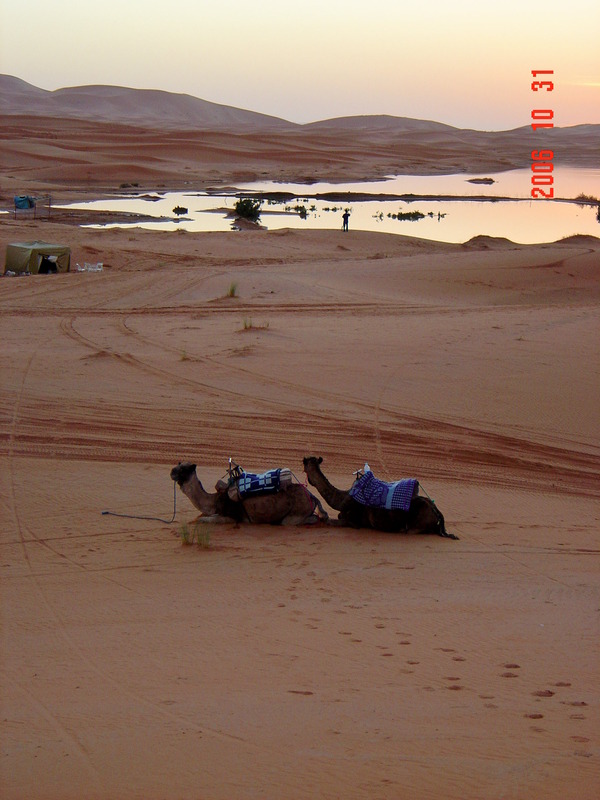 Our camels were docile and we traveled at a pace that allowed us to soak up the setting sun’s show. I had the feeling that these men and their camels were enjoying the utter silence of the windswept dunes just as we were and that they would have been on the same stroll that evening, whether we had showed up or not. 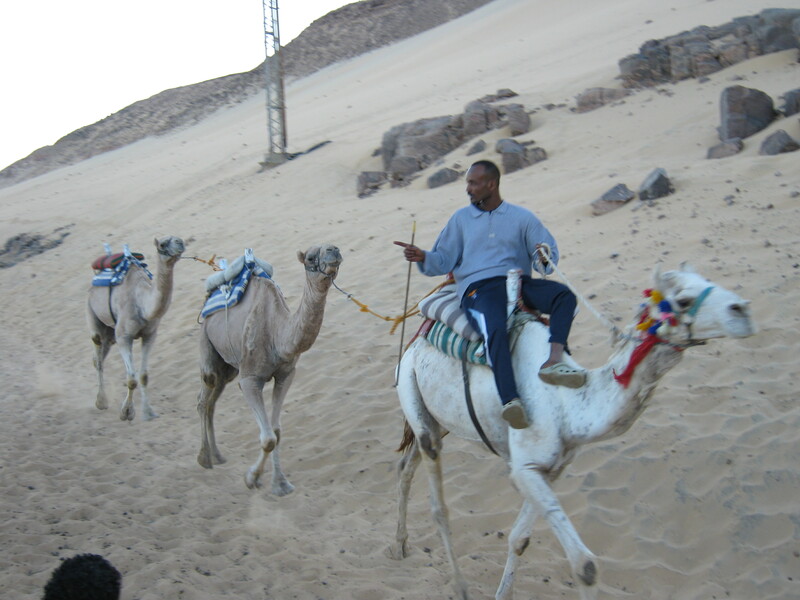 A few years later on a trip to Egypt, we were in Aswan where they offered camel rides. We had enjoyed it so much in Morocco that we were excited to experience it again. While the camels in Morocco were on their evening stroll in their quiet backyard, the camels in Egypt were like factory workers putting in hours of labor, knowing their job was to get you from A to Z as fast as possible. They had their bosses shouting at them and you could see the agitation on their faces as they hoped for their “15 minute” break. 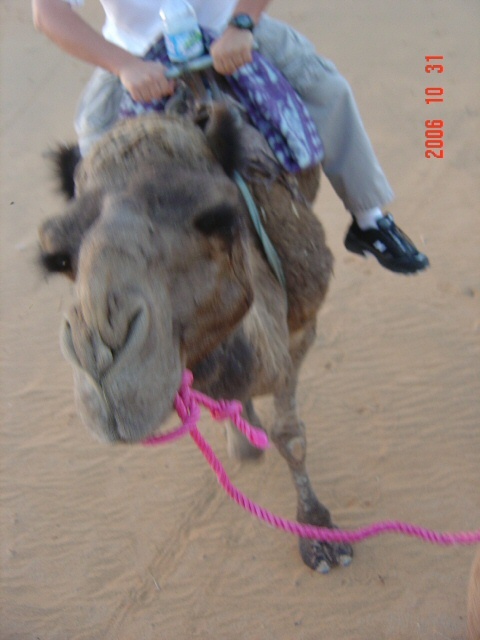 I got on my camel and held on for dear life, white knuckled the entire ride. Being on an animal with “Skinny Bone Jones” legs and an axe to grind is scary enough, but we had the added pleasure of traveling on a hard path with a steep drop off. My life flashing before my eyes wasn’t exactly the scenery I had in mind. 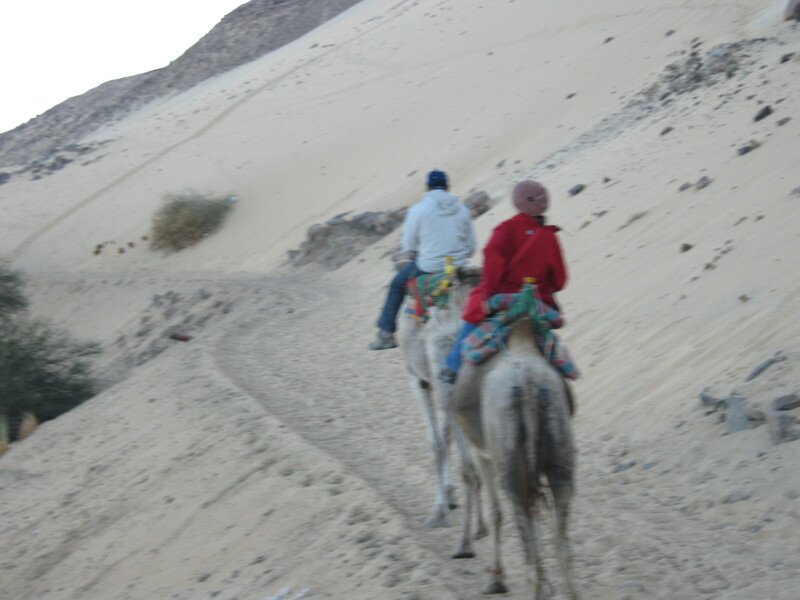 We arrived swiftly at our drop off point and getting off the camel as it dipped forward was just as terrifying, if not more, than the ride. I don’t have memory of this experience being so traumatic in Morocco. Maybe it had something to do with there being only rock hard ground to break my fall if I slipped in any way. I don’t blame the camels. I thank them both for the rides, each memorable in their own way. 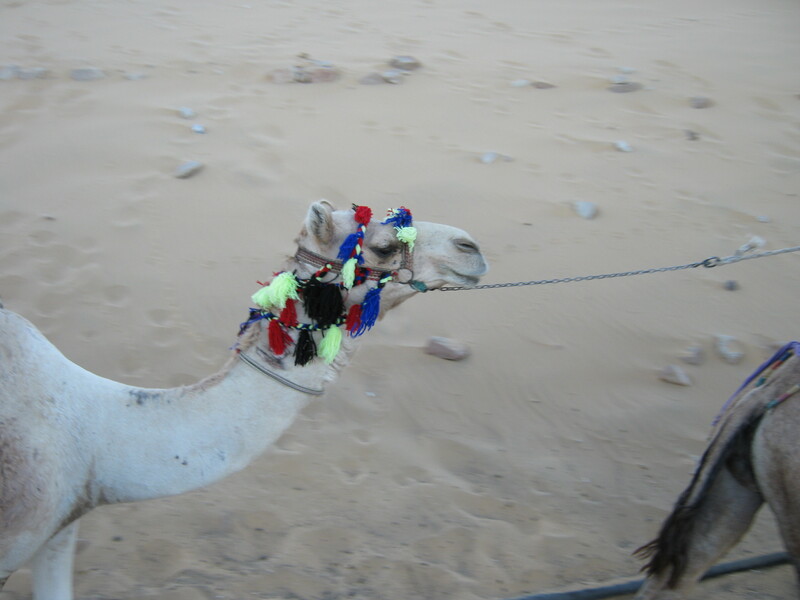 My tale of two camels leads me to the conclusion that as with many things in life, the positive energy and intention one puts into something, greatly affects the outcome.